In May 1998, India shocked the world—and many of its own citizens—by detonating five nuclear weapons in the Rajasthan desert. Why did India bid for nuclear weapon status at a time when 149 nations had signed a ban on nuclear testing? What drove India's new Hindu nationalist government to depart from decades of nuclear restraint, a control that no other nation with similar capacities had displayed? How has U.S. nonproliferation policy affected India's decision making? India's Nuclear Bomb is the definitive, comprehensive history of how the world's largest democracy, has grappled with the twin desires to have and to renounce the bomb. Each chapter contains significant historical revelations drawn from scores of interviews with India's key scientists, military leaders, diplomats and politicians, and from declassified U.S. government documents and interviews with U.S. officials. Perkovich teases out the cultural and ethical concerns and vestiges of colonialism that underlie India's seemingly paradoxical stance. 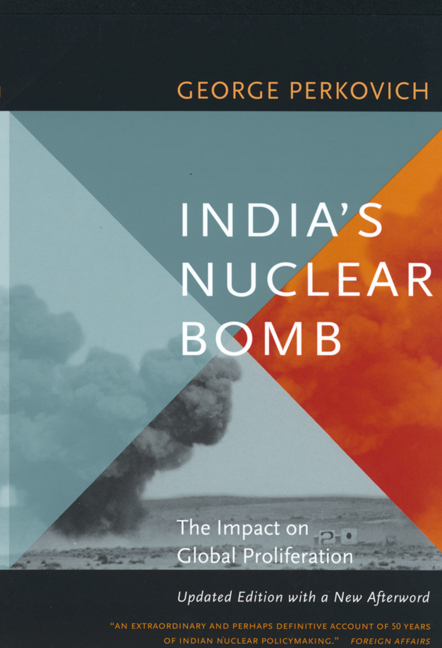 India's nuclear history challenges leading theories of why nations pursue and hang onto nuclear weapons, raising important questions for international relations theory and security studies. So, too, the blasts in Rajasthan have shaken the foundations of the international nonproliferation system. With the end of the Cold War and an even more chaotic international scene, Perkovich's analysis of an alternative model is timely, sobering, and vital. George Perkovich is Director of the Secure World Program of the W. Alton Jones Foundation and a member of the Council on Foreign Relations and the International Institute for Strategic Studies. His work has appeared in Foreign Affairs, Foreign Policy, the Bulletin of Atomic Scientists, the Washington Post, and other publications.